BERKELEY, CA � Mary Kimberly Lawrence, better known as "Molly," widow of Berkeley Lab founder and namesake Ernest O. Lawrence, has died. She passed away Monday, Jan 6, at the ManorCare nursing home in Walnut Creek. She was 92. 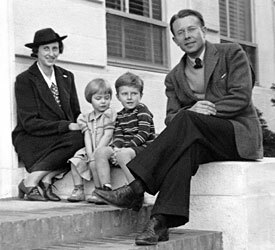 Molly and Ernest Lawrence shown with daughter Margaret and son Eric in 1939 outside LeConte Hall on the UC Berkeley campus. Berkeley Lab Director Charles Shank offered his condolences to the Lawrence family. "It was my extraordinary pleasure to have met and talked with Molly Lawrence," he said. "She was a unique presence, and her vivid impressions of Ernest Lawrence and the Laboratory were profoundly moving and meaningful for me." Molly Lawrence's health had declined since she suffered a stroke in 2001. She moved into the nursing home last year after having spent nearly 70 years in the Berkeley hills home she and Ernest shared after their marriage in 1932. Molly, the daughter of Dr. George and Mabel Blumer, was 16 in 1926 when she met Ernest, who was 25, on a blind date. Dr. Blumer was the dean of the Yale medical school at that time and Ernest was a new member of the Yale physics faculty. Molly was a brilliant student with near-perfect recall who would enter Vassar College that year and go on to earn a degree in bacteriology. She continued her graduate education at Radcliffe College but took most of her courses at Harvard's medical school. According to her family, so rare were women students at that time, the Harvard faculty excluded her from some anatomy lectures to shield her feminine sensibilities, a bit of nonsense she never forgave. She married Ernest on May 14, 1932 at the historic Trinity Church in their hometown of New Haven, Connecticut. The Lawrences became a celebrity couple in Berkeley as Ernest would win the 1939 Nobel Prize for Physics for his invention of the cyclotron, making him the first University of California Nobel laureate. He went on to become a major figure in the development of the atomic bomb during World War II and one of the nation's most prominent scientific leaders after the war. He founded his radiation laboratory in 1936 which would eventually become the Lawrence Berkeley National Laboratory, and, in 1952, founded what today is the Lawrence Livermore National Laboratory. Molly's sister, Elsie, married UC Berkeley physicist Edwin McMillan, who would go on to also win a Nobel prize and succeed Ernest as director of Berkeley Lab. Molly and Ernest had two sons, Eric and Robert, and four daughters, Margaret, Mary, Barbara and Susan. After Ernest's death in 1958 at the age of 57, Molly not only raised their children but also took in two teenaged neighbor girls the night their mother died. Even though her hands were full as a single parent, Molly served on the boards of such organizations as the United Way of the Bay Area, the East Bay Children's Activity Center, the Berkeley Day Nursery, and the Travelers Aid Society. She also served until her death on the advisory board for the Lawrence Hall of Science. Molly Lawrence is survived by her sister Margaret (Peggy) Biles of Bradbury, California, sons J. Eric Lawrence of Culver City, California, and Robert Lawrence, M.D. of Stockton; daughters Margaret Norman of Long Beach, Mary Prud'homme of San Francisco, Barbara Petit of Berkeley, and Susan Lawrence of Berkeley; Cheryl Larmore of Alamo and Darlene Bruno of Berkeley; plus 11 grandchildren, five great grandchildren, and many nieces and nephews. A memorial service will held be at the Lawrence Hall of Science, 100 Centennial Drive, Berkeley, Friday, January 24, 2003, at 4:00 p.m. In lieu of flowers or other gifts, donations may be made to the Lawrence Hall of Science. Checks can be mailed to the University of California, Berkeley Resource Development, Lawrence Hall of Science #5200, Berkeley, CA 94720-5200.